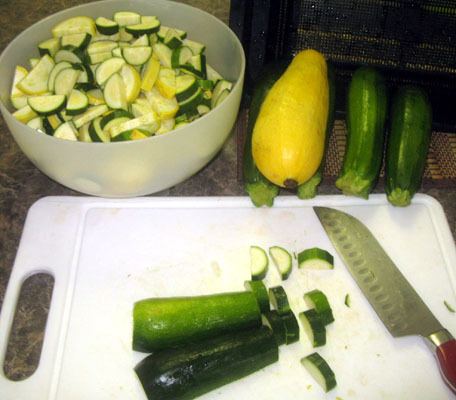 I know there are a lot of you who dread the zucchini; I used to be one of you. 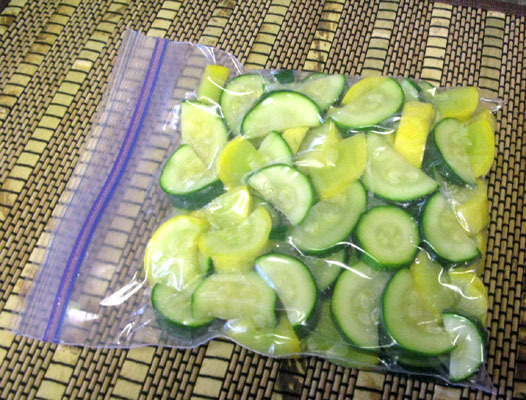 It is a joke around here that at this time of year you have to make sure you lock your car doors while at church or you will return to your car to find it full of zucchini and squash. The only reason I ever minded a car full of squash was that I could never seem to get it cooked and eaten before a)it goes bad or b)we all get sick of it. I have a couple simple suggestions for using squash and zucchini that will put a smile on your face and happily fill your tummy. 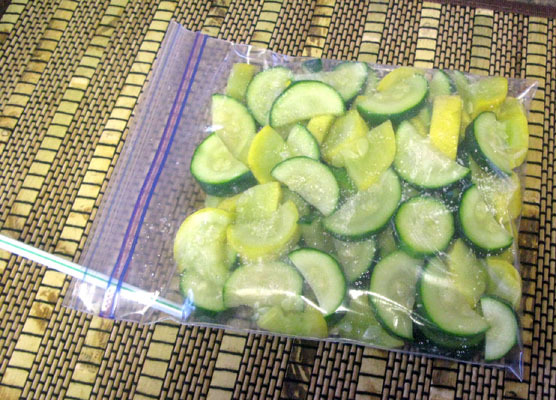 I also have some instructions on the best way to freeze preserve your excess. BTW: I got all this for $4 at my local orchard/farm store! Freshly plucked and still covered with dirt. The best way to enjoy your gardens (or someone else’s) bounty of squash through the next year is to freeze it. But shoving it in the freezer as is isn’t going to work. The procedure is pretty simple though. 2. 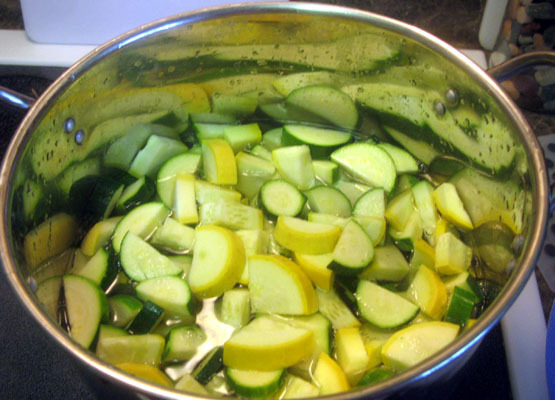 Set a pot of water on to boil, make sure it is big enough and full enough for the pieces of squash to move freely. 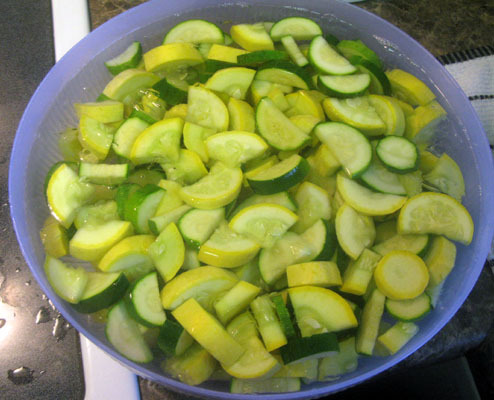 Next to this prepare a large bowl of ice and water to receive the hot squash. 3. Now we are going to Blanche the squash. Blanching is simply applying heat to kill the enzymes in the vegetables that change the color and consistency of veggies over time. We want to blanche the squash/zucchini for 3 minutes on high with a lid on. The water can be used repeatedly (both hot and cold) as long as you keep the levels high and the temperatures generally fixed. 4. Once you have boiled the squash on high for 3 minutes it is time to scoop it out of the hot water with a spider or slotted spoon and drop it quickly into the ice bath. 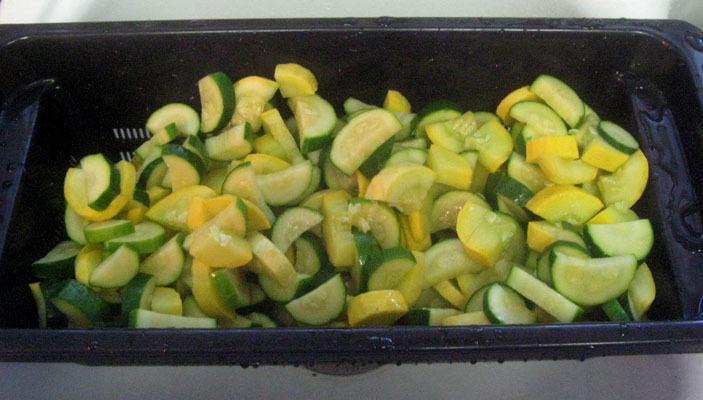 This stops the cooking process so that the zucchini will still have firmness and color. Keep them in the cold water until they are cool themselves. So what to do with all this squash? I add it to everything, especially curries or any dish that has some kick. 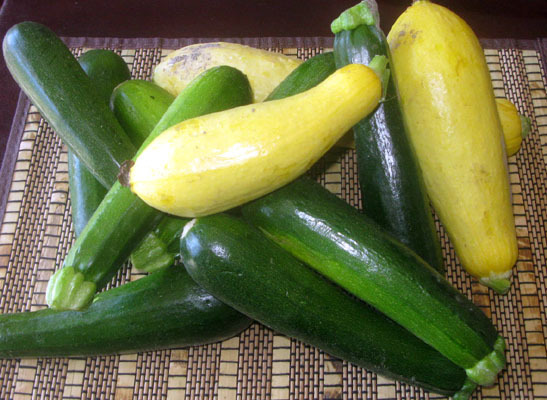 The simplest way to use squash or zucchini is in a skillet with a little butter and garlic, or dipped in egg and crusted with bread or cracker crumbs then deep fried. Preheat oven to 350°. Mix the cooked beef & onion, the rice, and the sauce in a bowl. Layer this with zucchini and grated cheese in a 9”x13’ baking pan topping with remaining cheese. Bake for 20-30 minutes till bubbly, remove and serve. Optional: garlic or onion powder, mustard powder. Melt butter over low heat, stir in flour and seasonings. Gradually add milk, stirring until well mixed. Cook over low heat, stirring constantly, until thickened and smooth. Cook for 5 minutes longer; adding cheese slowly. Stir until smooth and well blended. Hope you find it fun and delicious! 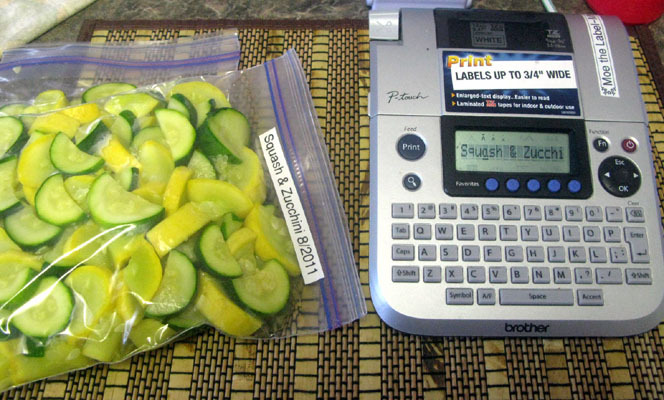 We LOVE having zucchini (sliced, diced, shredded, speared) in our freezer! We put it into pretty much everything! Smoothies - you truly can't taste it and you get all that nutriton; Everything that uses a batter; casseroles; OMLETS is a fav; and who could forget mock strawberry jam?! !